Home Transportation Can Metro Really Complete These 4 Rail Projects Before the ’28 Olympics? Can Metro Really Complete These 4 Rail Projects Before the ’28 Olympics? The Winter Olympics in South Korea are now in the rearview mirror, and there are only four global competitions left before L.A. plays host to the 2028 Summer games. There may be no bureaucratic entity sweating the countdown more than Metro, which has promised to deliver 28 transportation projects before the ’28 Opening Ceremonies. The “Twenty-Eight by ’28” initiative is mostly marketing—many of the projects on the list were already scheduled to open before the games, and some are relatively modest endeavors, like bike paths along the L.A. River or tolls in HOV lanes. Still, there are four Measure M-financed rail lines that Metro is trying to expedite so they’re ready for the influx of athletes and spectators. Here’s how much progress has been made on the projects so far, and the chances they have for being operational in 10 years or less. Aw, the Green Line. The Redondo Beach-to-Norwalk light rail known as the line from “nowhere to nowhere” is actually only half operating right now. Several of its stations are shut down as Metro works to connect it to the under-construction Crenshaw Line. When the new line opens next year, the Green Line will be more useful, allowing easier connections to Santa Monica, DTLA, Inglewood, and the Crenshaw District, of course. Riders will also be able to get closer than ever to LAX, but the People Mover that will take travelers directly to terminals won’t open for another five years. The planned South Bay Light Rail Extension will bring the Green Line even deeper into the South Bay; right now it terminates in a colorless office park section of Redondo Beach. The roughly five-mile extension will stretch it to Torrance, with stations that include a stop at South Bay Galleria and a terminus at the under-construction Torrance Regional Transit Center. Previously, the extension would have fully run along the Harbor Subdivision rail right-of-way which Metro owns—that would make the line relatively easy to build and not too pricey. 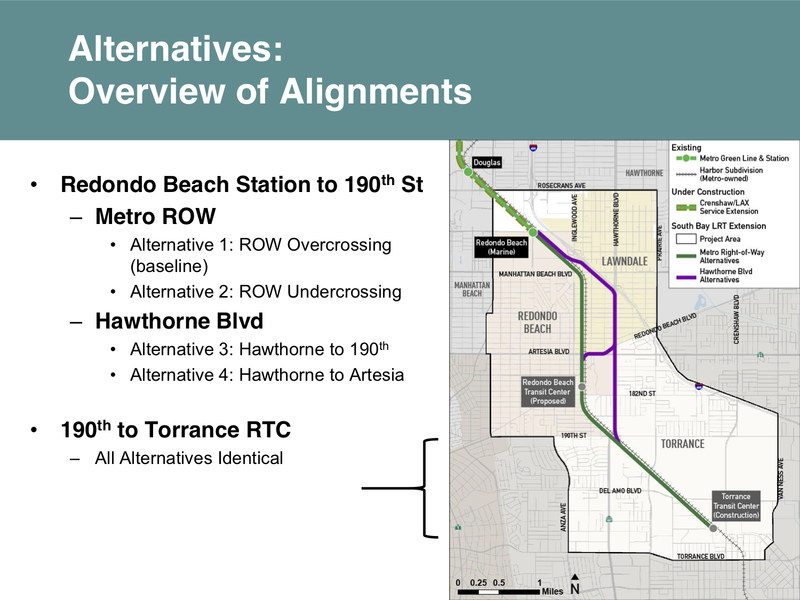 But Metro is now considering rerouting part of the line to dog-leg on Hawthorne Boulevard; another alternative includes a short stretch on Redondo Beach Boulevard. Obviously, Metro needs to go with a line that’s most cost-effective and serves the most people, but the fact that the agency’s not even sure of the route doesn’t bode well for timing—especially since community meetings on this project have been ongoing for nearly a decade. Initially, the extension was supposed to open in 2030, but that’s been bumped up to 2027. Hopefully, a final route will be picked this summer. 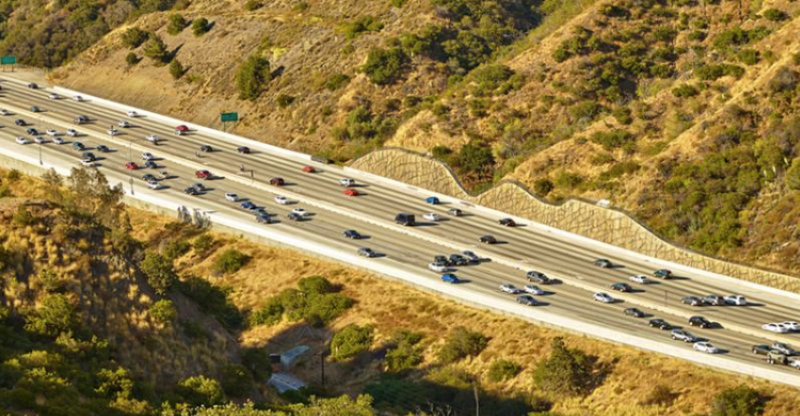 The mysterious Sepulveda Pass project will run under or near the 405. One of the most anticipated projects Metro is planning, this project will connect the Valley to the Westside, and finally offer an alternative to the 405. Exciting, right? Especially since the Olympic Village is rumored to be at UCLA. But details on this line have been scant, to say the least. We’ve heard numerous times that companies have expressed interest in a public/private partnership—where they’d help fund and build the project for a cut of fares, free advertising, or some other benefit—but nothing solid has been revealed; Metro just says they’re reviewing the proposals. As far as the route, that is also unclear, as a feasibility assessment was ordered back in late November. The project would likely have to be a subway or underground light rail, since an elevated line would likely rile the residents of tony enclaves like Bel-Air and Sherman Oaks. But routing, setting aside time for community meetings and environmental clearances, as well as tunneling the darn thing could take well over a decade. We’re not sure how this project—originally scheduled for completion in 2033—will make its new 2028 ribbon-cutting date. When the Regional Connector opens in three years, riders will be able to travel between Santa Monica and East L.A. on one train—amazing! Even better, after the Eastside Extension to Whittier or South El Monte opens, commuters will be able to head even further east into the county. 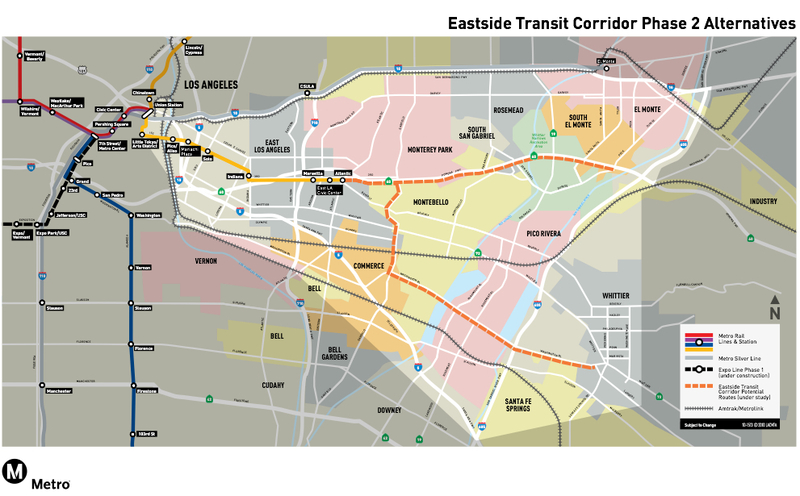 But Metro still hasn’t determined if it should terminate in Whittier or South El Monte. As initially planned, the Whittier iteration would mostly follow Washington Boulevard and include a station at the Citadel Outlets. The South El Monte route would run alongside the 60 freeway and cover a lot of ground in Montebello. Building out both versions has also been floated, but there may not be enough funding to build both legs. Both options have complications; the 60 route runs through a Superfund site, while the southern route may require a nearly three-mile long subway tunnel, a very expensive addition. We haven’t heard much about the project since the spring, when both routes were fine-tuned. Environmental studies have yet to begin on each proposal, another ominous sign for a project that’s supposed to be running seven years earlier than its long-planned 2035 opening. Metro hopes to bring this planned light rail project to southeast L.A., specifically Artesia, a whopping 13 years early, moving up service from 2041 to 2028. Again, Metro does not yet know what route it will take and has many, many options to study. 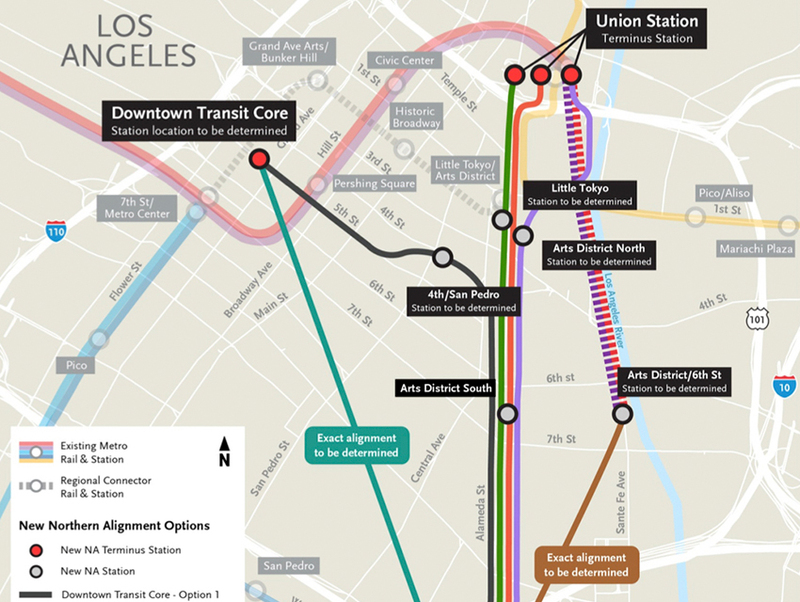 Moving south from DTLA, the line would travel either on Santa Fe Avenue, east of the urban core, or on Alameda Street, directly south of downtown. But Metro doesn’t even know if the line will terminate at Union Station or at a yet-to-be-determined station somewhere closer to the Financial District and the Historic Core. Wherever it travels, the West Santa Ana Branch will traverse some pretty dense neighborhoods that are stocked with either residents or industry. Planning a light rail around such a built-up environment will require much studying, planning, and careful construction, so Metro needs to pick a route soon. 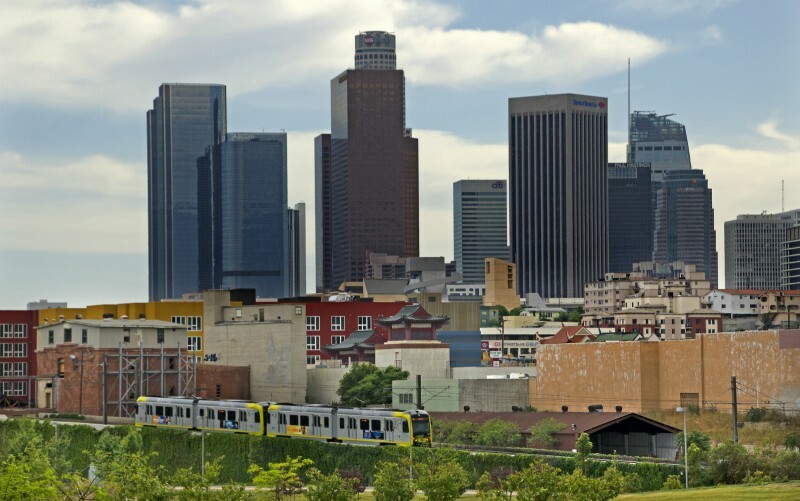 The good news: the burgeoning Arts District will most certainly get at least one station.